Stunning Views (2017, six lightboxes, each 20cm x 15cm). For many in the region (past and present) issues of employment and infrastructural investment may take precedence over appreciation of landscape. In the current climate, social inequality and disenfranchisement is exacerbated by property prices, particularly in regions officially designated as 'beautiful.' 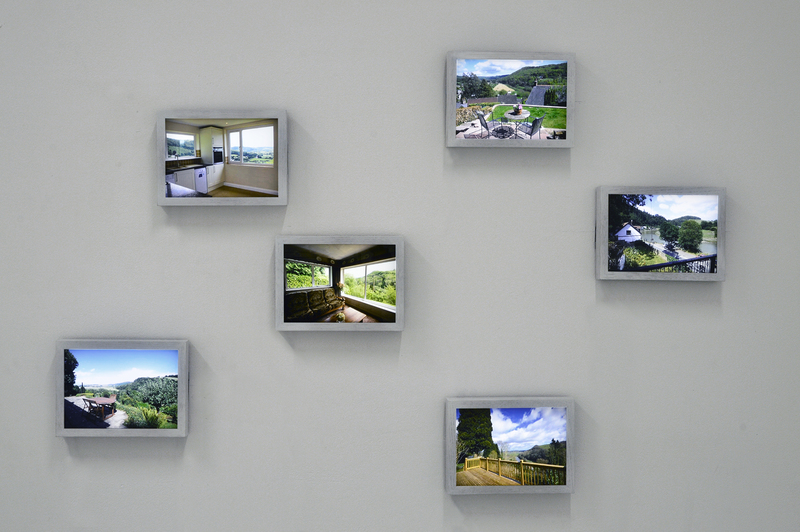 In this work I have appropriated estate agents’ images of property for sale in the Wye Valley described as having ‘stunning views.’ The view of appealing landscape is in this sense commodifed and is something that can be possessed. In the eighteenth century, during the time of the Picturesque movement, there was similarly a degree of ownership of beautiful vistas. Many country houses built at this time were designed to give impressive views over an estate, which, quite often, was landscaped to appear natural. Hence, both in the past and present day, there is an alignment of the elevated vantage (offering beauty) and social elevation, often achieved through property and accrued capital. The Stunning Views images are shown as a cluster of lightboxes, akin to the esate agent's window.